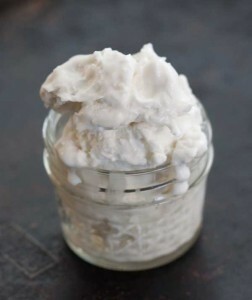 Coconut milk ice cream made from leftover coconut milk. This recipe will give you about 1 pint of very rich, creamy, ice cream. I use Taste of Thai or Trader Joe's brand. In a mixing bowl, whisk together coconut milk, cream, sugar, extracts and coconut. Put the mixture in an ice cream maker and process as the manufacturer directs. Eat immediately or transfer ice cream to a 2 or 3 quart container and freeze until firm. This ice cream is fairly solid when frozen, so let it sit out for a few minutes or defrost in the microwave for a few seconds to soften.